With its small footprint, an optional, same-side input/output hopper and an optional Wi-Fi® accessory that allows you to print anytime and anywhere, the DTC4250e consumes minimal space and offers maximum flexibility. The printer is also fully compatible with Asure ID® Card Personalization Software for creating custom credentials and Colour Assist™ software that can help you match spot colours, ensuring accurate reproduction of such complex graphics as company logos or employee photos. Provides organizations with a high-performance, energy-efficient photo ID printing solution that supports corporate green initiatives and helps reduce costs. As part of its new ENERGY STAR rating, the default time for sleep mode has been lowered from two hours to five minutes, and printer design enhancements reduce the power consumption while in standby or sleep mode. 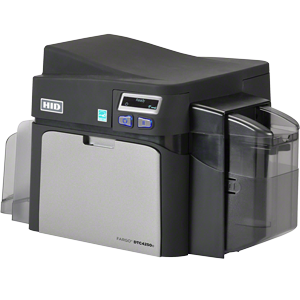 (ENERGY STAR qualified card printer (base models only without encoders)).